The Electrician's Trade Demystified!, by David Herres, is, per the cover's claim, "Everything an aspiring electrician NEEDS to KNOW." That is a pretty bold claim for a book of 250 pages when considering how wide AND deep the field of electrical tradesmanship really is. However, because of the way in which David approaches the subject, I am convinced that within reasonable constraints of expectations, the book does an excellent job at informing an aspiring electrician with everything he needs to know. How can I corroborate the assertion, you might ask? Simple. There is no attempt to cover every chapter word by word or to impart a comprehensive knowledge of every topic to the reader. Instead, all chapters are addressed in terms of what kind of material is contained, how it is arranged, what material should be memorized by every electrician, and how the table of contents and index can be used to locate needed information quickly. What the reader comes away with after reading through the entire book, as did I, is a very good understanding of what kinds of expectations and obligations will be placed upon the shoulders of anyone desiring to work his or her way from an apprenticeship all the way up to taking and passing the Master Electrician license exam. As in his book, 2011 NEC Chapter-by-Chapter, Mr. Herres (a licensed Master Electrician) applies a style of written prose which reflects significantly his Bachelor's Degree in English literature. That is not to say you should expect the King's English in the pages; i.e., no instances of "prithee apply a wire nut to thine wire junction" or 'fudgel not whilst thou shouldest be burying UF cable betwixt hither and yonder driveway lamp post." What you do get is a successful job of presenting each area of focus without seeming like a rote boilerplate repetition of an outline where only key words and phrases change each time. You probably know all too well what I mean re boring repetition. Another welcome feature is the interspersing of historical tidbits as they apply to various topics; for instance, mention of Danish physicist Hans Christian Ørsted's important work in the relationship of magnetism and current flowing in a conductor. Having embarked my own career in the field of electron manipulation as an electrician prior to eventually earning a Bachelor's degree in electrical engineering, many of the topics presented in The Electrician's Trade Demystified!, are near and dear to my nostalgic waxing about earlier days. Sometimes it is simply due to being reminded of my humble beginnings, sometimes due to being made aware of how requirements of many tasks have changed, and other times from realizing how ignorant of the 'big picture' I really was at the time. I spent three years in high school in an electrical vocational program where three hours each day consisted of learning wiring techniques, motor and control theory, Ohm's law, the electrical code, safety, and even bending conduit. Prior to enlisting in the USAF to work on air traffic control radar systems, I put in a few years working as an electrician and managed to get pretty good at what I was called upon to do. However, as time went by I realized how ignorant I was of a lot of the more specialized and high skill level electrical code and techniques. David, "Bless his heart," as the locals here in North Carolina like to say, really helps drive home how much I never knew. Thanks for that, David! Here are a few examples of what I either learned for the first time or just re-learned after having forgotten. The distinction between a 'grounded conductor' and a 'grounding conductor,' while maybe seeming obvious, is an important concept to grasp when interpreting the National Electric Code (NEC). It can make the difference between passing inspection and failing inspection, as well as make the difference between a safe installation and an unsafe installation. In summary, a 'grounded conductor,' is meant to carry the return current from a 'hot' wire back to a point where it is grounded to Earth. A 'grounding conductor' is meant to carry current only under a fault condition and also is grounded to Earth. If you are familiar with standard plastic-sheathed Romex cable like 14-2 w/ground used for a 115 VAC residential circuit, the neutral wire (white insulation) is the 'grounded conductor' while the 'grounding conductor' is the bare copper wire that is usually wrapped in paper. Mixing the two functionally can present a serious potential for electrocution and/or fire. I don't recall ever having violated the principle, but neither do I recall understanding the technical distinction between the two. Being sure to remove old, 'abandoned' wiring is a matter of both safety and code compliance in specified environments. Cable insulation, unless specifically designed for use in plenums, is notoriously toxic, especially older types, so getting rid of unnecessary cable is both good practice and a requirement. Another good bit of information is that of minimum radii on cable runs. We RF types are well aware of the minimum bend radius requirements on coaxial cable to prevent the inner geometry from altering impedance, but solid power delivery cables also in some instances must obey such rules because of the possibility of inductive heating. Grounding wires (note the distinction heretofore mentioned) are particularly in need of compliance because any mount of excess inductance hinders stray current from returning to Earth rather than through a human. Lightning protection can be rendered useless if enough inductance is present due to multiple bends and coils of wire. Filling of raceways with a number of conductors is a topic I remember consulting the NEC handbook for many times while working on commercial buildings. What I do not ever recall doing was worrying about derating for ambient temperature. I don't remember reading any news stories about buildings I wired burning down, so probably my habit of never filling a conduit to capacity paid off. As I read through the section, I imagined how challenging it would be to write a computer program that would take all parameters into consideration (wire gauge, insulation type, temperature, conduit inner diameter, etc.) and yield an answer that complies with the electrical code. 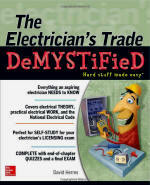 So, I recommend The Electrician's Trade Demystified! to any budding electrician or someone like myself that appreciates an occasional refreshing of knowledge learned long ago. Enjoy!